← #2018 word of the year…. Welcome to 2018 and the newest 52 week Blog Challenge. This year I’m getting on board from day 1 and the first prompt is a goodie. Parents of multiple children will tell you that they love each of their children equally. I only have one child so I can say for me, that’s true. I love my daughter over all other children. But I tend to think that parents with more than onlies are giving themselves a line. I may be wrong, but I’ve seen it in families I know. One child is usually more favored by a parent whether they mean to show it to the world or not, than the others. **For you parents of multiple children, please don’t yell at me or send me angry tweets. This is simply my opinion, and I’ll explain why next. This week’s prompt is the Favorite thing I’ve written and why. Now, authors are like parents. Each of their books are considered to be their babies and are treated as such. Most authors will tell you if you ask them which is their favorite book they’ve written, that they love them all equally ( just like parents of multiples will.) Each new book is like a new child, to be loved and cherished and adored. After 10 books published ( and a total of 41 written) I do have one favorite that stands above all the others. The reason is simple: it was the first book where I had the HERO fully flushed out in my mind before I ever had a heroine for him. 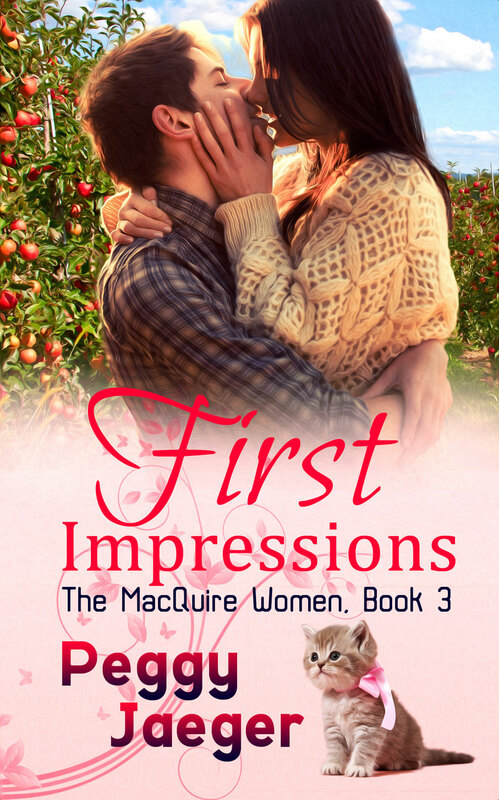 FIRST IMPRESSIONS is the love story of Padric Cleary and Clarissa Rogers. Pat’s a veterinarian and Clarissa is a family doctor. Before I ever had a thought about Clarissa, Pat was a fully formed person in my head. He’s my favorite male character because he’s so misunderstood by everyone, including his twin sister, Moira. Everyone in Carvan thinks Pat’s a playa. It’s true that he does date a lot of girls, but its because he’s looking for the one. He wants the same kind of love his parents have – everlasting, complete, and romantic. Every girl he dates thinks they can change his love ’em and leave ’em personality. But Clarissa Rogers isn’t interested in Pat and – of course- that makes her the perfect girl for him. This was the third book in the MacQuire Women Series that Wild Rose Press published for me and I love it the best of all my books so far simply because I adore Pat Cleary! Here’s the official blurb: Family Practice Doctor Clarissa Rogers’ first impression of Padric Cleary is biased and based on gossip. The handsome, charming veterinarian is considered a serial dater and commitment-phobic by his family and most of the town. Relationship shy, Clarissa refuses to lose her heart to a man who can’t pledge himself to her forever. Now, since this is the first blog of the year in the MFRW blog challenge, stop by some of these other authors and see what they consider the favorite thing they’ve written is. My Favorite Book. . . Bears! I have got to put this one on my TBB list. LOVE the premise! Okay, okay, I won’t leave you an angry response 🙂 but I will say that I don’t understand parents who actually have a favorite child. It just isn’t how my brain works. Your book sounds great. Gotta love a terrific hero! I have four children, and all four of them have some characteristic that makes them my favorite in one way or another. But do I have an overall favorite? Maybe, maybe not (and I’m not trying to be cutesy). Let’s just say I root for the underdog, whoever that may be at the moment. Well, THAT’S going on my TBR list! Thanks for sharing, Peggy! I love each of my four children for their individual qualities. I don’t have a favorite. My heart couldn’t choose between them. But, as a writer, I do understand picking favorites with your written books. Although, I can’t pick just one of those either! lol Padric sounds intriguing! I love that he came to you as a fully fleshed out character. Makes writing him all the more fun, I imagine! I love this cover!! sounds so good!